Description: Important woodcut map of Central Europe with parts of France and Flanders orientated South of North from Munster's highly influential geographical work. Description: RARE map of Europe, finely engraved, with the Northeast Passage prominently shown and an inset containing delicate miniature costumed figures. Strong impression. 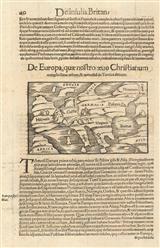 Description: Early map of Europe from Magini's reduced edition of Ptolemy's "Geographia". Coloured. Description: Title page for Book I, Part II of Paulus Merula's "Cosmographiae generalis" featuring a miniature map of Europe by Jodocus Hondius accompanied by descriptive text in Latin. Coloured. Description: Europe. Early miniature map. Coloured. 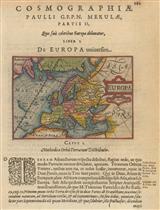 Description: Early map of Europe with descriptive text in Dutch on the verso. Coloured. Description: Splendid Dutch Golden Age map of Europe by one of the leading cartographers of the period. Decorated with ships, sea monsters, and strapwork cartouches. French text on verso. Original hand-colour. Description: Europe as it was known by the Romans. Published at the height of the Dutch Golden Age of map making, by two of its leading figures. Coloured. Description: Charming early map of Europe copied from Joducus Hondius for publication in "Purchas his Pilgrimis" (1625). Strong impression. Description: John Speed's exquisite map of the ancient Roman Empire embellished with miniature city views along the upper border and costumed figures on both sides. English text on verso. Strong impression. Description: Early miniature map of Europe based on John Speed. Coloured. 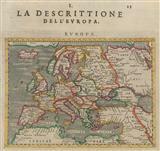 Description: Europe by one of the leading figures of the Dutch Golden Age of cartography. Decorated with sailing ships and wild animals. Coloured. Description: Stunning Dutch Golden Age carte de figure of Europe. Embellished with bird's eye views of cities, costumed figures and additional interior decoration. Original hand colour. Description: Map of Europe, showing the mythical island of "Frisland" in the North Atlantic. Coloured. Description: Early English map of Europe based on Visscher and Blaeu with bird's-eye city views in the upper and lower margins, and with portraits of "ordinary" Europeans in the side margins. Coloured.